Frankly, many of us on the spiritual path are freaked out by the thought of freedom. Something lurking within us associates it with rebellion, the throwing off of authentic authority. We want to be free, yet we don’t. We remain fearful, for all our religio-spiritual talk, that we’re going to be jumped upon from a great height, by either a controlling parental figure or, more scarily, by God, the One above who keeps tabs on all our ‘motivations’ and ‘actions’. So, we tend to oscillate between two Self perceptions: one tucked safely under authority and one who roams free to answer to no man or divinity. Not surprisingly, neither is true freedom. Please let me explain. Both settings are the fruit of our fearful, wounded psyche-soul known as ego. Ego cannot truly settle, its restlessness keeping us constantly on the move to avoid condemnation and shame. The trouble is that it’s fuelled by the very obstacles it attempts to keep us clear of. So the answers to freedom don’t lie in the soul-driven sphere, the realm of desire bombardment and certain disappointment. No, true freedom lies in the dimension of spirit. Now many have a problem with that, for they don’t believe in it or, more accurately, have never had it explained to them. The level of knowledge regarding the main aspects of our being is, I’m afraid, pretty ethereal or non-existent within most faith groups who claim to follow the Nazarene. The psyche-soul is often the hidden driving force behind much religious thought, practice and experience. It’s a bit like being an eternal caterpillar, one who never gets to flutter in the clear blue skies of destiny. Yes, many of our strenuous efforts and much of our religious drive lie within the operational command of ego, who disguises itself as our angel of light, duty and self-sacrifice being the fruit of its fear-fuelled restlessness. Contrastingly, when we experience spirit we know it, really know it. It can’t be whipped up by any incantation of our own making. No ritual or level of religious zeal can drag it into our consciousness. Spirit appears when it wishes. That’s why many have called it Lord. Like the wind we aren’t quite sure where it comes from or where it goes to but we do get to feel its mysterious, life-changing effects. Our wah moments in Nature or in meditation, are often manifestations of its willing touch. So what defines this freedom of Spirit? Well, simply in us having an alternative source on which to draw upon. Awakening to the somewhat shocking realisation that we’re not the incessant demands of our ego, but rather a spark from the Divine Fire is mind-bogglingly liberating. In other words, we can opt out of the ego storms of much of our psychological life, by simply letting go. Taking such a decision tips us into the boundless Ocean of Divine Love, that all consuming sea of Spirit Source, from which we emerged on the day of our space-time birth. As old Larry Norman used to sing, we’re really only visiting this planet, this ego realm of angst-driven storms and floods. Now, the Nazarene, Yeshua bar Yosef, was a man who knew where he’d come from and where he would return. A man aligned and in tune with Divine Spirit and all its endless possibilities; a man through whom the compassion of Divine Love flowed in its fullness, announcing a new freedom, one that tackled the problem of ego head-on in all its various forms. This quote from the Aramaic New Testament, one attributed to the Galilean prophet, is certainly a bold claim. Yet, how does the son make us free? Not I believe, by applying the standard formula of salvation, as pushed by many brands of Christianity i.e. freedom from sins, guilt and an eternal hell. No, the freedom of the Nazarene is one to be experienced here and now, in the roller-coaster Journey we optimistically call Life! The freedom gained is a freedom from acquisitive desire, the power plays of ego and a sense of great aloneness, indeed abandonment. 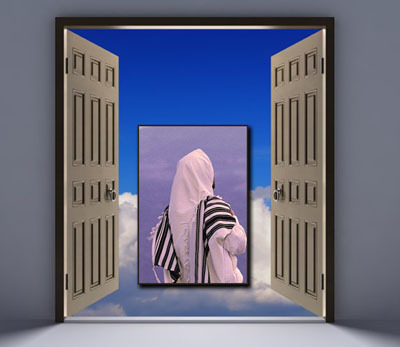 As we marinate in the spirituality of Yeshua we discover an inner resonance and realignment beginning to take place, a renewed contact with Spirit Source via the spirit spark portal within. We’re drawn into a new dimension, one filled with experiential meaning and a profound, new, inner peace. We’ve been rebirthed into the Womb of Divine Love, the place where we were meant to be, indeed have been, all along. This liberation is available to us all as we come into resonance with the Divine Essence, as channelled by Yeshua’s life and words. Of course ego will resist the healing efforts of our new Awareness, by dragging us from time to time, back into the battlefield of our old psyche-soul settings. Yet, something has radically changed. We now have an alternative to the monopoly of ego and its fears. We can switch back into the place of Divine acceptance and desire liberation at will. For a recovering religious junkie like myself that truly is Good News! Richard Rohr and Meister Eckhart would be most pleased! Thanks Robert. I’ve never read Richard’s work but folk say our thoughts are similar. Him a Franciscan and me a recovering Ulster Protestant ~ Divine mystery indeed. I can relate to the writings of Meister Eckhart. I guess he was a 12th century thinker far ahead of his time within Medieval Catholicism and branded as a heretic for it. A wonderful exponent of the inner life. Thanks Robert.A franciscan and a dominican – woh! If only my Ulster Protestant brothers were of the same mind! I hear “Ulster Protestant” and my first instinct is to shut my mouth, back up, lock my door and turn off the lights! That particular tribe is a strange wee beasty among the clans of mankind! There’s a heart of gold somewhere deep within but it is hard to find at times! Nice post, Dylan; I look forward to reading your new book. Working on the book at the moment. Formatting each chapter one by one! Hopefully be out in paperback in a month or so. on February 12, 2014 at 12:36 am | Reply Jeanne S.
OK, Dylan, it all sounds wonderful, Now how does this happen?